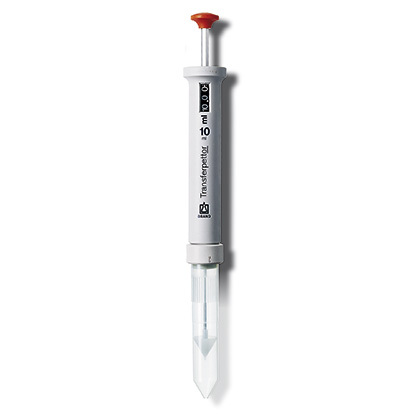 Product and ordering information for the Transferpettor™ positive displacement pipette. Accurate, reproducible results with viscous, foaming, high-vapor-pressure, and other “problematic” liquids. 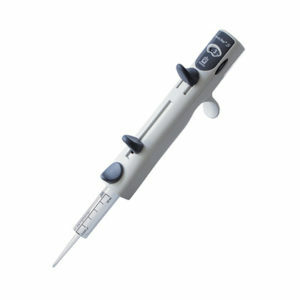 The Transferpettor™ is the ideal tool for use with liquids that render traditional air displacement pipettes ineffective. 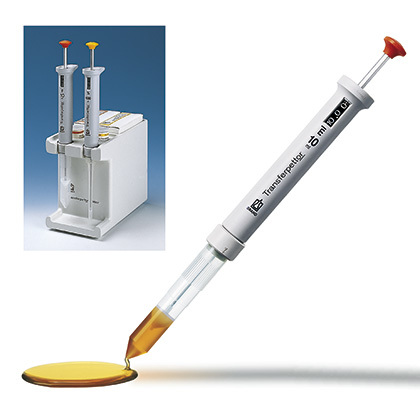 Unlike air displacement pipettes, the piston of the Transferpettor™ directly expels the media from the tip, wiping the tip walls completely clean. This results in negligible residual wetting and highly accurate, reproducible results, especially with viscous, foaming, high-vapor-pressure, and other "problematic" liquids. The Transferpettor™ is supplied with one tip & seal, seal mounting/removal tool, performance certificate, operating manual, and one year warranty. *The value of accuracy and coefficient of variation are final test values referring to the delivered nominal volume, instrument and distilled water at equilibrium with ambient temperature (20°C/68°F) and with smooth operation. 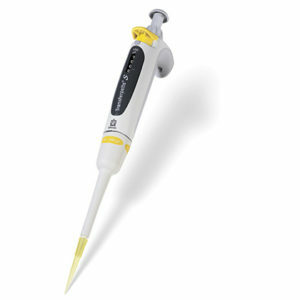 The pipette housing is made of polypropylene, which is the same material that pipette tips are made of. If you can pipette it, you can splash it on the housing. However, in general, it's not a good idea to soak a pipette housing in solvents for cleaning. The tips and seals for the Transferpettor™ are replaceable parts. While reusable, they are wearable and should be replaced periodically. The piston rod is also replaceable, but only requires replacing if damaged. My Transferpettor™ always dispenses considerably smaller volume than it's setting. What's wrong? Before you send it out for calibration, you may want to make sure you the tips are placed on the pipette correctly. 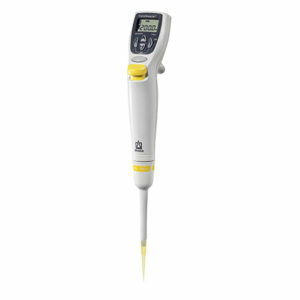 The pipetting button must always be pushed down before locking the tip into place. If the button is not pushed down all the way, the tip can be pushed on further than appropriate, and the volume will be smaller. If the tips are put on correctly, and the volume is still inaccurate, the Transferpettor™ can have a calibration adjustment performed. However, this is not a user function. The pipette should be sent in for authorized service. Liquid drips from the end of the tip when I'm pipetting. There are several possilbe causes for this: 1) It is possible the tip was not installed properly. See "Attaching the new tip", page 13 of the operating manual, to reinstall the tip. 2) You may also have a damaged seal. Seals are a wearable part and require periodic replacement - see page 14 of the operating manual. 3) You may have a bent piston rod. The piston rod is replaceable. See the operating manual for the correct catalog number for your instrument and replacement instructions: click here. There is liquid above the seal in the tip. Either the tip or the seal is damaged compromising the tightness of the seal between the two parts. Change the tip. If that does not resolve the issue, change the seal. Can I autoclave the Transferpettor™? No. The Transferpettor™ can not be autoclaved. If the unit needs to be decontaminated, it can withstand the usual output of a UV sterilization lamp. Note that the effects of the UV may cause some color change to the plastics. Are the tips and seals for the Transferpettor™ autoclavable? The SOP for the Transferpettor™ is available here. Additionally, all of the SOP's for BRAND's liquid handling instruments, as well as the BLAUBRAND volumetric glassware, are compiled in EASYCAL™ 4.0 for easy reference. Note: The instrument is not autoclavable. Reusable Tips - Polypropylene tips are supplied in color-coded packaging to match the volume of your instrument. Reusable Piston Seals - Polyethylene seals are supplied in color-coded packaging to match the volume of your instrument. Transferpettor™ Station - Convenient storage of your instrument and accessories. Keeps 2 instruments, tips and seals conveniently at hand.